NAHA, OKINAWA PREF. 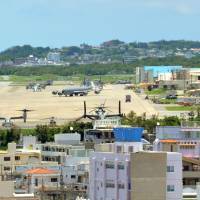 - The Okinawa branch of the Naha District Court ordered the government on Thursday to pay some ¥754 million in damages to residents near the Futenma air base because of aircraft noise. Some 2,200 plaintiffs who live close to the controversial U.S. base in Ginowan complained of mental distress, poor sleep and disruption to their daily lives. In seeking about ¥1 billion in damages from the central government, they also said they feared aircraft crashes, according to lawyers representing the plaintiffs and their lawsuit. “The noise damage suffered by the plaintiffs is serious and widespread,” presiding Judge Satoshi Hikage said in the ruling, adding that the court found that the damage reached an unacceptable level. 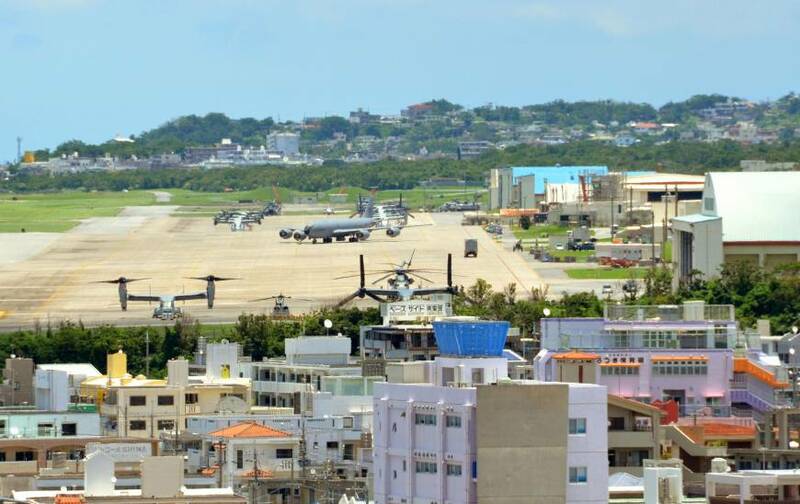 The ruling comes as Japan and the United States are seeking to move Futenma to a less densely populated area further north on Okinawa Island and return the land at Ginowan to Japanese control. Local opposition is running high, however, and many people in Okinawa want the base moved outside the prefecture altogether. Chief Cabinet Secretary Yoshihide Suga argued the government had failed to fully explain its arguments to the court. “We will adequately deal with this after coordination among the ministries and agencies concerned,” he said at a news conference. The suit follows a similar one filed by local residents in October 2002. In that case, the Fukuoka High Court ordered the government in July 2010 to pay about ¥369 million in damages to the plaintiffs. But it rejected their plea to suspend early morning and evening flights. The latest suit was filed in 2012 by individuals who were not plaintiffs in the earlier case. During the trial, the government sought an exemption and to reduce the sum of compensation, arguing that some of the plaintiffs had moved to the area knowing that an air base existed there, and that the government had taken measures to reduce noise, such as funding noise abatement work on homes. The plaintiffs’ damages were reduced as the court recognized that the government’s noise abatement measures had been effective, to some extent. The court also dismissed the claims of around 80 plaintiffs who lived in areas where the noise level is below 75 on the Weighted Equivalent Continuous Perceived Noise Level, or WECPNL, an internationally recognized index for aircraft noise. The decision was in line with the 2010 Fukuoka High Court ruling, in which the WECPNL of 75 or above formed the benchmark for ordering government compensation. The court did not acknowledge the suffering the plaintiffs said was caused by low-frequency sounds from helicopters, citing a lack of evidence.